This christmas papercraft is a simple 3D Christmas Tree decoration, created by Melopruppo. It is a cubeecraft style Christmas Tree, hope you like it. This building paper model is a Milpersac Medieval Castle for Diorama, created by Luc Mahler. This paper craft is a Nativity Scene diorama for Christmas, created by Shoo Rayner. There are also Nativity Papercraft Set and Nativity House Paper Model on the site, and other Nativity Scene paper craft available. This paper car is a Toyota Corolla E120, the ninth generation of cars sold by Toyota under the Corolla nameplate, the paper model is created by Orange Toyota. There is another Toyota Corolla E120 (Corolla Fielder) paper model on the site. This paper toy is a chibi Kousei Arima, the main protagonist of the Japanese manga series Your Lie in April (known in Japan as Shigatsu wa Kimi no Uso, or just simply Kimiuso), the papercraft is created by Paperized Crafts. Kousei is a piano prodigy and was the youngest pianist ever to win the Saki Competition. However, he quit playing after the death of his mother resulted in his inability to hear the sounds of his own playing. Following the death of his mother, he lived for two years without playing the piano and saw the world in monotone, but this changes after meeting Kaori Miyazono, a young violinist who pushes Kousei to his limits in an attempt to get his fingers back onto the piano keys. This christmas paper craft is a Nativity Scene Paper-Cut, created by Lia Griffith. This building paper model is a Normandy House, created by Luc Mahler. It is a good papercraft for diorama. This pokemon papercraft is Porygon-Z (PorygonZ), a Normal-type Pokémon, based on the anime /game Pokemon, the paper model is created by javierini. Porygon-Z evolves from Porygon2 when traded holding a Dubious Disc. It is the final form of Porygon. There is another Porygon-Z papercraft on the site. Although technically a virtual, manmade Pokémon, Porygon-Z does have a physical body. Its head is fuchsia and ovoid in shape with a short, blunt antenna protruding upwards and a blue bill similar to that of a duck. Its eyes are yellow and have black rings, similar to a bulls-eye. The head is completely detached from the body and floats slightly above it. Its smooth, ovoid body is fuchsia with a blue ring connecting its arms. Two arms are loosely connected to its upper body and other than their blue color, have no features. The tail is also blue and featureless, but slightly resembles a paddle. This papercraft is a simple Moving Car for Kids, created by krokotak. Printng the template and with cardboard, toothpicks, glue and scissors, you and your kids can spend some time together building their own racing carts. This christmas papercraft is a vintage Santa Claus, created by Le Hedan, shared by Agence Eureka. This christmas paper toy is a Santa Claus Puppet Automata, created by M Gulin. This pokemon papercraft is Ducklett (Koaruhie), a dual-type Grass/Flying Pokémon, based on the anime /game Pokemon, the paper model is created by Brandon. Ducklett evolves into Swanna starting at level 35. This pokemon papercraft is Rowlet (Mokuroh), a dual-type Grass/Flying Pokémon, based on the anime /game Pokemon, the paper model is created by Brandon. For further information and another Rowlet papercraft please click on: Pokémon: Sun and Moon - Rowlet Papercraft Ver.1. This papercraft is a Christmas Nativity Diorama, created by MyLittleHouse. There are also Nativity Paper Set Ver.1, Ver.2, Ver.3, Ver.4, Ver.5, Ver.6 and Ver.7 on the site. This paper toy is a chibi Major Motoko Kusanagi, the main protagonist in Masamune Shirow"s anime and manga series, the papercraft is created by Paperized Crafts. This paper model is created by vintage spanish typical Viviendas Diorama, created by Fernandes Vigara, shared by Mauther. This papercraft is a Christmas Nativity Diorama, created by Martin Didier. There are also Nativity Paper Set Ver.1, Ver.2, Ver.3, Ver.4, Ver.5 and Ver.6 on the site available. Here are several Star Wars printable Gift Boxes, created by Printable Crush. 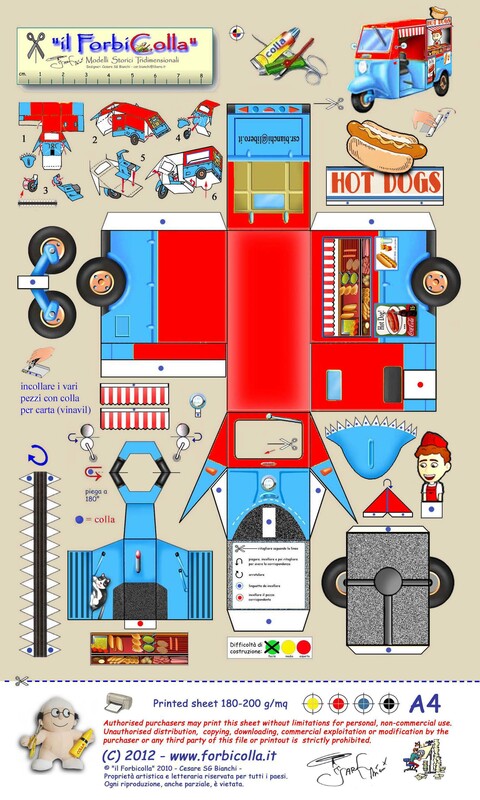 This paper model is a Hot Dog Three-Wheeled Vehicle, created by Forbicolla. 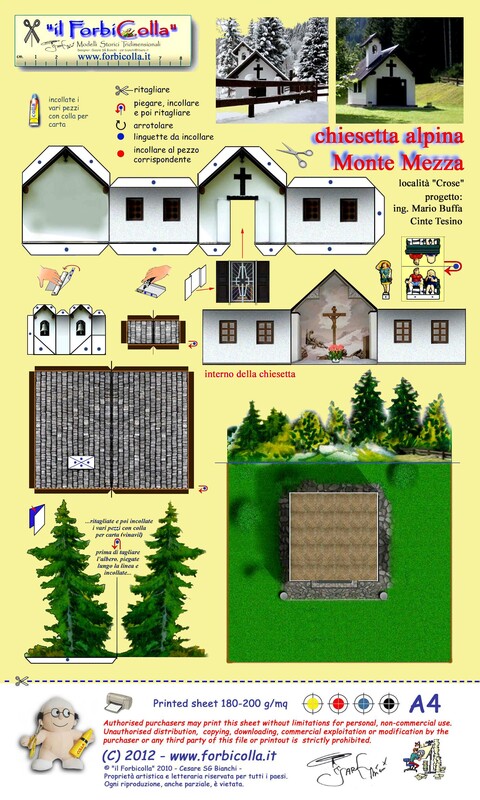 This paper model is Monte Mezza"s Alpine Church, created by Forbicolla. This pokemon papercraft is Dartrix (Fukuthrow), a dual-type Grass/Flying Pokémon, based on the anime/ game Pokemon, the paper model is created by javierini. Dartrix evolves from Rowlet starting at level 17 and evolves into Decidueye starting at level 34. Dartrix is an avian Pokémon that resembles an owl. Most of its plumage is white, but it has a dark brown hood covering its head, shoulders, and back. Its heart-shaped, facial disc is also white, and it has large eyes with dark irises that usually appear closed, a stubby beak that has a white upper jaw and orange-brown lower jaw, and two short tufts of feathers on the back of its head. Two green leaves curve around its face, resembling an asymmetric cut; the leaf on its right is longer than the one on the left. Under its chin are two smaller leaves that resemble a bowtie, and there are two pointed ones on its rear that form its tail. Its wings have two tan spots on the upper side and leafy plumage close to the body on the underside. Within the leaves under its wings are two orange-brown objects similar to seeds. Dartrix has orange-brown talons with two toes facing forward and one facing backward. This papercraft is an Orange Star (known as Red Star) Headquarter, the Empire State Building, New York, United States, a Capitol-like building, from the Advance Wars video game series, the paper toy is created by Ninjatoes. The size of the finished model is about 3,9 cm x 3,92 cm x 10 cm. This animal paper model is a simple low poly Kangaroo, a marsupial from the family Macropodidae, the papercraft is created by Geo Animals. This animal paper model is a simple low poly Baby Penguin, created by Geo Animals. This animal paper model is a simple low poly Armadillo, created by Geo Animals. Armadillos are New World placental mammals with a leathery armour shell. The Chlamyphoridae and Dasypodidae are the only surviving families in the order Cingulata, part of the superorder Xenarthra, along with the anteatersand sloths. This christmas papercraft is a Santa Claus Ornament, created by Moo Hive. This animal paper model is a simple low poly Moose, created by Geo Animals. This paper model is a Minecraft Style Adrian Shephard, a 22-year old US Marine Corporal assigned to the Hazardous Environment Combat Unit from the Santego Military Base, Arizona, where he was trained by Drill Instructors Dwight T. Barnes and Sharpe, and the silent protagonist of Half Life series, the papercraft is created by Chippy. This paper toy is a Demon Possessed Monster Truck, created by Zigmund. This paper toy is a chibi Kaori Miyazono, one of the main characters of the Japanese manga series Your Lie in April (known in Japan as Shigatsu wa Kimi no Uso, or just simply Kimiuso), the papercraftis created by Paperized Crafts. Kaori Miyazono was a violinist who helped Kousei Arima return home after his mother"s death. This christmas papercraft is a simple Gingerbread House, created by Dover, and shared by Mauther. This paper craft is an Elephant Head Wall Hanging Decoration, designed by Dhal021. This is a 1 meter version. There are also Elephant Head Wall Hanging paper model and Ver.2 on the site available. This pokemon papercraft is Electabuzz (Eleboo), an Electric-type Pokémon, based on the anime / game Pokemon, the paper model is created by Brandon. Electabuzz evolves from Elekid starting at level 30 and evolves into Electivire when traded holding an Electirizer. There is another Electabuzz Papercraft on the site. This pokemon papercraft is Ash"s Greninja (Satoshi"s Gekkouga), the first Pokémon that Ash obtained in the Kalos region, based on the anime / game Pokemon, the paper model is created by javierini. This pokemon papercraft is Vikavolt (Kuwaganon), a dual-type Bug/Electric Pokémon, based on the anime/ game Pokemon, the paper model is created by javierini. Vikavolt evolves from Charjabug, and it is the final form of Grubbin. This christmas papercraft is a Christmas Tree Candy Box, designed by Erico for Canon Papercraft. This christmas papercraft is a Christmas Tree Calendar, designed by Pan Design and Masahiro Watanabe for Canon Papercraft. This christmas themed papercraft is called Happiness, designed by Akamine Tom & Sakai Tyu for Canon Papercraft. These christmas papercrafts are simple Santa Claus and his Reindeer Miniatures, designed by Aya Honda and Hanae Nozaka for Canon Papercraft. These christmas papercrafts are lots of Christmas Wall Sticker Decorations, designed by Ayako Kishi for Canon Papercraft. There is also another series on the site available. This christmas papercraft is a Christmas Tree Ornament, designed by Aya Honda for Canon Papercraft. These christmas papercrafts are lots of Christmas Wall Stickers, designed by Aya Honda for Canon Papercraft. This christmas papercraft is a Christmas Mobile Decoration, designed by Aya Honda and Hanae Nozaka for Canon Papercraft. There is another Christmas Mobile papercraft on the site. This christmas papercraft is a Merry Christmas Banner, designed by Canon Papercraft. This banner isjust the thing to decorate your Christmas party. Let"s put up pretty decorations and have a wonderful party! This papercraft is Capricorn Shura, one of the Gold Saints, based on the anime Saint Seiya, the paper model is created by Lestat Pendragon. Shura belongs to the fabled rank of Gold Saint hierarchy among the other 12 Gold Saints. His guardian star is of the zodiac sign of Capricornus. Shura is the Gold Saint that underwent some modifications in his ideology when the manga was adapted to animation. While the anime series shows Shura as being the most loyal Saint to Athena, Kurumada depicted in his manga a Capricorn Saint that at first was somewhat reluctant, but short moments before his death, rediscovered his loyalty to Athena, and remained faithful to her even after his death. According to the manga, Shura, just like Cancer Deathmask and Pisces Aphrodite, knew that Gemini Saga was behind the Pope"s mask but he still was obeying his orders. As he says in his fight against Shiryu, he doesn"t believe anyone fights for a god anymore, so he doesn"t care about fighting for Athena. He considered that those with power, were automatically qualified to be judged just. He thought that the Pope, even being evil, using that power, could use it for some good. This figure papercraft is poseable Velvet, the princess of the destroyed kingdom of Valentine and the granddaughter of the mad King Valentine, based on the video game Odin Sphere, the paper model is designed by Kujiracraft. The finished model stands about 17 cm tall. Velvet is the twin of Ingway and daughter of Princess Ariel and Demon Lord Odin. She is Odin"s first born daughter and the older half-sister of Griselda and Gwendolyn. Velvet wears a revealing outfit - she contains her hair in a red cap decorated with black lace and golden star ornaments. Her top covers her breasts and leaves her midriff open. She wears a red half-skirt with a dark drapery around her hips, and black stockings, finishing with black slippers. It makes her seem like a gypsy. She also has fairly long, blond hair as revealed when she was held captive in Titania. She is described to be a very serious and independent young woman with a lot of issues, but only because she has gone through a lot of problems in her life as an outcast to both her grandfather and initially her whole nation when the people of Valentine heard that she and her brother were the children of the enemy. But, despite all of these troubles, she tends to be a sweet, kind and even motherly woman. She is also very determined to succeed in her goal to prevent Armageddon and save all of Erion. She has a deep hatred for her father, the Demon Lord, because she believed that he left her, her brother Ingway and their mother; and that he did not care if they all were to be killed by her grandfather. She also denies that he loved or even cared about them, saying that if he did love them he would have done something to prevent her mother"s death, or at least save her and Ingway from a life of suffering under their grandfather. She has a great fear of her grandfather despite him being dead and even believed that he would return. This is because when she was young he used to torture her and Ingway by whipping them. Her fear of him causes her to even still obey him despite knowing what he is planning. Throughout her life she has been haunted by the choice she and Ingway made: to reject their mother in front of their grandfather in order to live; and believed that by being tortured by King Valentine, and accepting the curse in the last letter their mother wrote to them, was the only way to earn her forgiveness. This papercraft is an Iron Legion Bust, from Marvel Comics" comic books and films, the papercraft is created by Rafael Cunha. The finished model is about 50cm tall. This christmas papercraft is a Minecraft style Nativity Scene, created by Jojesper. This papercraft is a Minecraft style Santa Claus, created by Mauther.